Page Content is a unique feature of Perpetua CMS that allows you to edit the material of your pages without affecting the design. Most commonly found on the homepage, Page Content is essentially editable content that is fixed to a custom design. Note: not every page has Page Content. Page Content lets you edit specific areas of a page from the same Page Content Menu. To accomplish this, Page Content is divided into Content Regions. To access the various Content Regions, click the dropdown menu at the top. To the right is an example of some Content Regions of a typical homepage. Click the region in the menu to edit. Use Default: This selection will use the defaults previously set on the website. When selected, the Content Region's fields are hidden. Override Default: This selection will allow the current page to override the default. The fields will expand and anything saved under these settings will only apply to the current page. Set Default: This selection will save all fields as the website default. Any page using the Use Default selection will be updated. Your homepage will most likely have an image rotator. 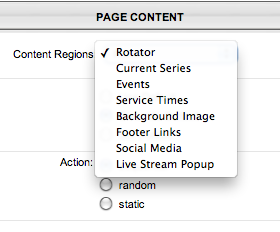 To set the images, links, and descriptions for the image rotator, you will use Page Content. Image: The image field is where the image can be uploaded from your computer or the Image Library. The dimensions will typically be listed next to the upload button. Link: Each image in the rotator can have a link attached to it. This can be selected from the dropdown menu or an external link can be pasted in the box below. The link is active when the respective image is being displayed. Description: The Description or Tagline region is where the image description is added. This is typically a field of text that is a few words to a few sentences in length. 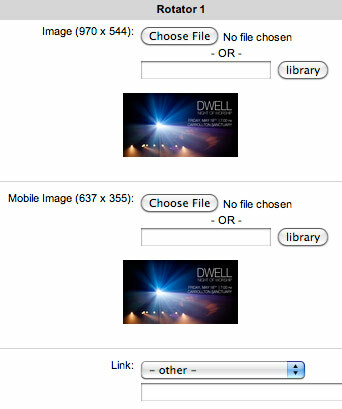 Mobile Image: If you have purchased a mobile version of your website, you have an additional image field for the mobile rotator. The dimensions should be listed next to the upload button.